Google Chromecast Audio Review - Does India need it? Google Chromecast Audio Review – Does India need it? Google India launched the New Chromecast and Chromecast Audio in India for the whopping price of Rs. 3499. 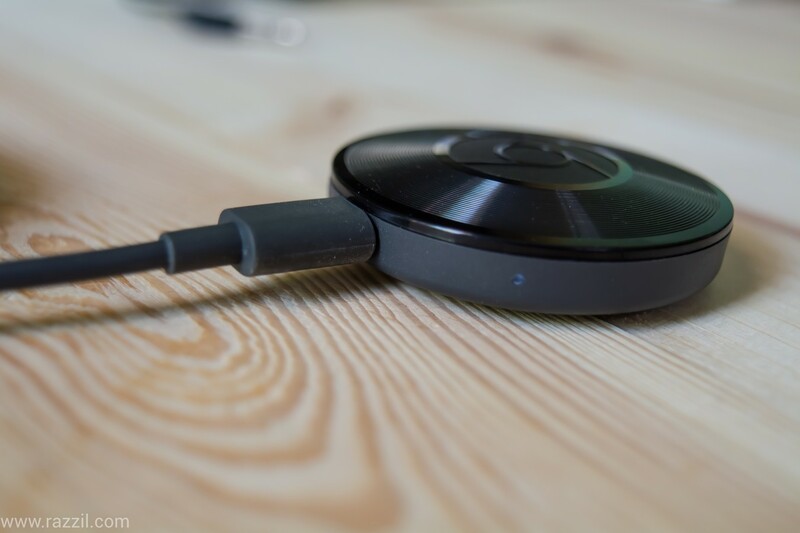 The Chromecast Audio allow the user to cast music wirelessly to any speaker that have 3.5 mm port. My Review of Google Chromecast Audio based on Indian user perspective in mind. Inside the box, you’ll find Chromecast Audio, Power Adapter, Power Cable and 3.5 mm Analogue Stereo Patch Cable. 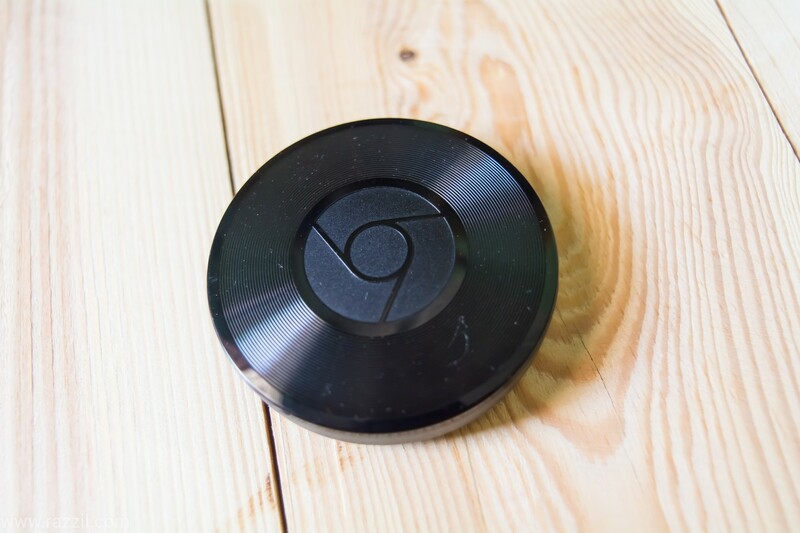 Google love to keep the device as simple as possible, same goes with Chromecast Audio. 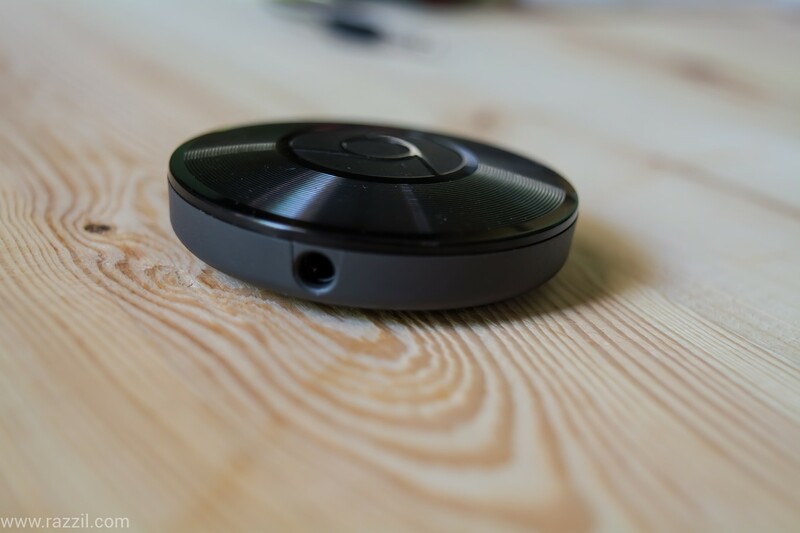 The Chromecast Audio is a tiny plastic disc with Chromecast logo in the center of the disk. Bottom of the surface is flat at the center so that circular disc remain stable when put it on plan surface. The Chromecast Audio Dimensions is 51.9 x 51.9 x 13.49 mm and it weight is just 30.7 g.
The device has two ports: micro-USB for power and a 3.5 mm audio jack. The device needs external power which you can provide with a charger that comes in the box or connect it to power bank. The Audio jack works with 3.5mm to 3.5 mm audio cable which comes with the device, 3.5mm to RCA cord and an optical audio output. Other than the ports, you’ll find LED status indicator and reset button on the side of the Chromecast disk. 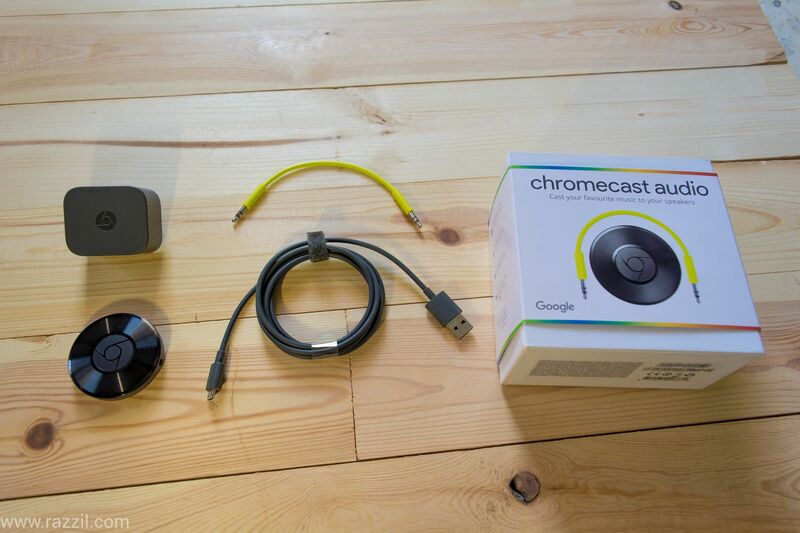 Setting up Chromecast Audio is very easy and require a one-time setup with your Wi-Fi. 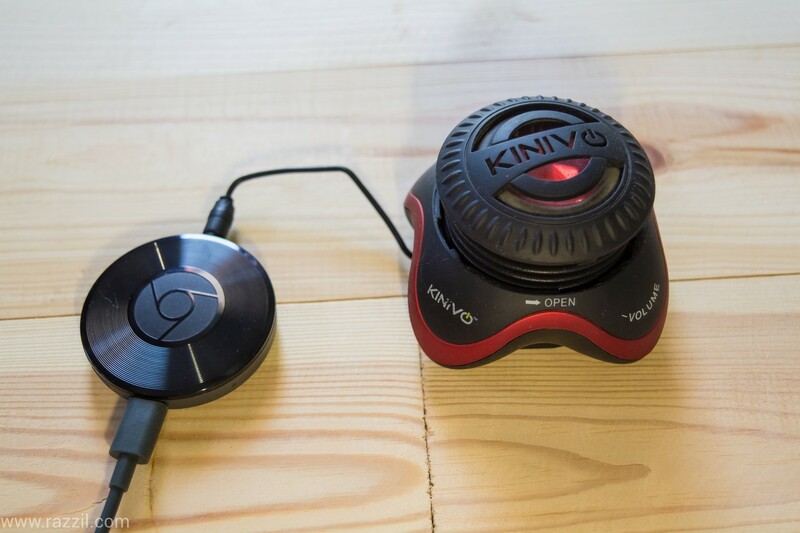 Plug the Chromecast Audio into a power source. In Google Cast app, select the devices tab and select the Chromecast Audio. Follow the on-screen guidance to complete the setup. Once setup completed, open compatible apps and look for Cast Icon on top of the app. Connect the app and start streaming music to your old speakers. 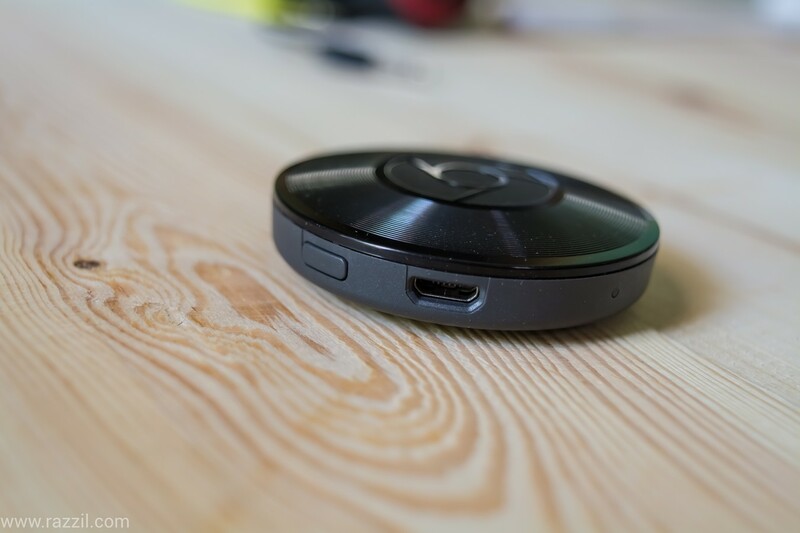 Once Chromecast Audio is setup, all you need to download some Chromecast compatible app, unfortunately for Chromecast Audio India users, there are very few apps that support Chromecast Audio. 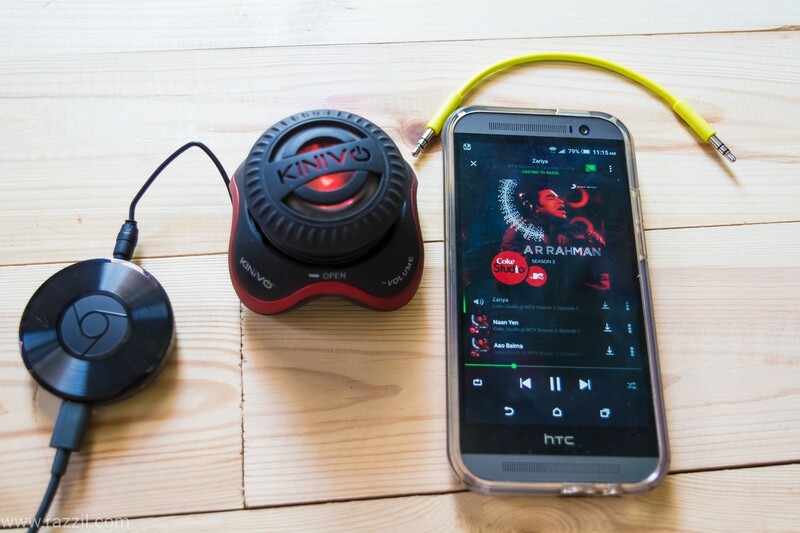 In fact, the Saavn & Wynk Music from Airtel are some popular apps that come with Chromecast Audio support. To play the music, connect your app with Chromecast Audio by tapping on Cast icon and the music will stream it through Chromecast. No matter on which Room you’re in, as long as you’re in Wi-Fi Range, you can stream music via Chromecast. In my testing, I’ve never seen any problem in that, it’s work 10 out of 10 times without any problem or lag. Once the Chromecast Audio is setup, your friends & family members can stream to Chromecast without pairing again. The only condition is the device should be connected to Wi-Fi Network. Chromecast Audio working is bit different than Bluetooth or Apple AirPlay / DLNA technology. Once you cast music to the device, the Chromecast will stream music directly from the Internet. It means your phone is free to do different things. For casting music, you need an Internet connection and a router, this means you won’t able to use with Dongle which is still the primary source for Internet connection in India. Use Screen casting to stream local phone music to Chromecast Audio. There is a workaround to play the offline music stored on your phone. You can use the Google Cast app to cast the screen and from there any music you play on the device will stream through the Chromecast Audio. Through the audio quality is not that great but still work well. Chromecast Audio comes up with two useful feature: Guest Mode & Multi-room. In Guest mode, you can allow guest to cast music to Chromecast Audio without letting him to connect it to you Wi-Fi Network. Device uses Nearby API to detect the device and you can provide a pin to let your friends to access the Chromecast. Through in my testing, it didn’t work. Only one time it manages to detect the Chromecast. In Multi-room, you can group devices together to play the same song on multiple speakers. Google Chromecast Audio support lossless high-resolution audio, it means you can stream high-quality audio to your speaker. Just make sure you choose the High standard quality in the Music app. Also the apps like Saavn, Wync automatically decrease the bitrate based on the Internet to stream the music without interruption. So yes, you can say the for high-quality audio you must have the high-speed internet connection. If you have an AVR or Hi-Fi system then you can switch on Full dynamic range from device setting to get the max quality from your speaker. Only one phone can connect to Chromecast at a time. If you connect another device, the first device will automatically disconnect. You need Wi-Fi Network with an Internet connection. You can’t take this device in a car or use dongle like Tata Docomo to stream music. Limited apps available for Indian users. No doubt Google Chromecast Audio is a great device but I believe it’s not suited for the Indian consumer. Avg. People of India spent time in traveling from Work to Home and vice versa. At that situation, Chromecast is useless as you can’t use it during the commute. There is no party culture in India where people assemble in the house and can play music loudly on Speakers. Only a few occasions are where people prefer to use loud music that’s too using DJ. Headphone & Earphone are still preferred methods to listen music. Most of the Indian people doesn’t have the dedicated Internet connection, they still use mobile network or Dongle which is not compatible with Chromecast Audio. My answer is NO! Simple Chromecast looks much better deal than this. Even If you purchase this, I don’t think you’ll going to use it frequently. On the other hands, Chromecast for TV is a more practical device as we love to watch Photos or Videos on the big screen and it stays hidden permanently behind your TV. Google India launched the Chromecast Audio at very high price. The Original price of Chromecast in the US is around Rs. 2300 but the India price is almost Rs. 1000 higher than the original price. Google could lower the price little bit to make it more competitive. I’m highly impressed with how Chromecast work, I still own the 1st Gen Chromecast for TV and actively used to cast photos & video to my TV. Chromecast Audio work brilliantly and turn any audio output into a smart device. And you don’t have to worry about the Internet connection as even in slow Internet speed you can stream music. Chromecast Audio work brilliantly and turn any audio output into a smart device. And you don’t have to worry about the Internet connection as even in slow Internet speed you can stream music.